Note 1: Just like the trailer, this post must begin with Sigur Rós's Sæglópur (Lost at sea). Note 2: Watch it on as big a screen as you can, on as bright a screen as you can. 'Life of Pi' is a Hollywood movie, directed by the Taiwan-born Ang Lee, based on a novel by the Canadian author Yann Martel, about a boy from Pondicherry, named Piscine Molitor Patel after a famous French public swimming pool complex, who on an epic journey half-way around the world to North America on a Japanese freighter, gets ship-wrecked in the middle of the Pacific Ocean, and is left to survive on a life-boat with a Royal Bengal Tiger, Richard Parker. Pi grew up with a deep faith in God. He embraced Hinduism, Christianity, and Islam. As a child, his mother used to tell him stories about Gods, about how Yashoda once beheld the Universe in Krishna's mouth. He thanks Vishnu for sending Christ to this world, and does namaaz because he finds beauty in the sound of the words even if he doesn't understand it completely. 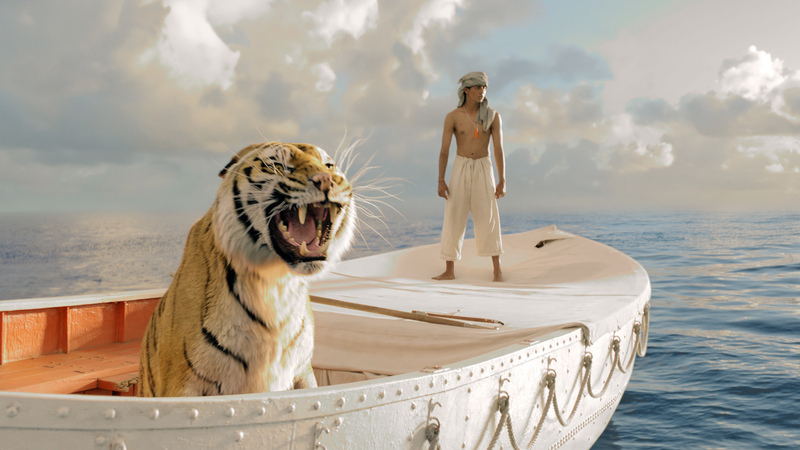 The story begins when Pi finds himself ship-wrecked in the middle of the ocean on a life-boat with a Tiger, having lost everything about his life. And oh boy does the story begin! The ship-wreck scene is brilliantly done, the camera work spectacular. Translating a small-life boat fighting for survival against HUGE waves to screen is no mean feat. You are transported right onto the boat and find yourself struggling as you fight to overcome the overwhelming waves. This seriously jeopardizes TDKR's shot at the cinematography Oscar. I like going to beaches because it overwhelms me, every time. Even by the shore, the sheer power and force of water makes me feel so tiny and insignificant, it feels like my problems do not matter one bit. Beauty is here, and only here. Ang Lee plays with the camera so well, the line between what is real and what is not, blurs. Our hero lies in the center of a continuous sky and the sea. Until, of course, the ripples bring us back to reality. Breath-taking. 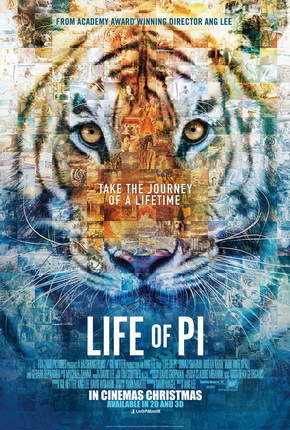 The struggle for survival, and surviving together, makes an unlikely bond between Pi and the tiger, Richard Parker. If it were ever allowed for non-humans to be nominated for a Best Actor award, this would be it. How in the name of God did they make a tiger do that?! No wonder this novel was claimed "unfilmable", and oh boy has Ang Lee proved 'em wrong. The struggle for survival brings Pi face-to-face with himself. Faith. Even though the story takes this view-point from a religion perspective, it has a broader message about faith. In anything. Purpose, in the most unlikely things. That is necessary. Absolutely. Not the need for survival, but a desire. To behold life's beauty. Love. If you stumble about believability, what are you living for? When Pi overcomes his fear, has nothing to lose, and surrenders, he sees the Universe in the ocean, as Yashoda did in Krishna. The spectacular imagery suspends you in a moment of disbelief until you are filled with nothing but awe and wonder. ...for everything has a trace of the divine in it. I see this movie as an allegory to life. We are all ship-wrecked in the middle of the ocean on our small little life-boats, with no land in sight. Yet the precious few we meet, and the unlikely few we fall in love with along the way. That is what makes the journey worthwhile. Are we lost at sea, or found at sea? Faith. Purpose. Love. Surrender. It is important to say goodbye. Only then can you let go, behold the spectacular, and embrace it with open arms. So, which version of the story do you believe? Richard Parker! Come! You have to see it! It's so... beautiful! ...and so it goes with God. We all like telling stories. About our life. Life is a story, afterall. Our story.